Gaspard de la nuit: Trois poèmes pour piano d’après Aloysius Bertrand is a suite of pieces for solo piano by Maurice Ravel, written in 1908. It has three movements, each based on a poem or fantaisie from the collection Gaspard de la Nuit, fantaisies à la manière de Rembrandt et de Callot completed in 1836 by Aloysius Bertrand. The work was premiered in Paris, on January 9, 1909, by Ricardo Viñes. The piece is famous for its difficulty, partly because Ravel intended the Scarbo movement to be more difficult than Balakirev’s Islamey. Because of its technical challenges and profound musical structure, Scarbo is considered one of the most difficult solo piano pieces in the standard repertoire. Written in C-sharp major and based on the poem “Ondine”, an oneiric tale of the water nymph Undine singing to seduce the observer into visiting her kingdom deep at the bottom of a lake. It is reminiscent of Ravel’s early piano masterpiece, the Jeux d’eau (1901), with the sounds of water falling and flowing, woven with cascades. This piece contains technical challenges for the right hand such as the fast repetition of three-note chords in the opening accompaniment, the double note passages beginning at bar 57, and the disjunct climactic movement of the hands beginning at bar 66. The duration of Ondine is about 6:30. A faint harmony that enchants my sleep. Of songs interrupted by a sad and tender voice. » Listen! – Listen! – It is I, it is Ondine who brushes drops of water on the resonant panes of your windows lit by the gloomy rays of the moon; and here in gown of watered silk, the mistress of the chateau gazes from her balcony on the beautiful starry night and the beautiful sleeping lake. » Each wave is a water sprite who swims in the stream, each stream is a footpath that winds towards my palace, and my palace is a fluid structure, at the bottom of the lake, in a triangle of fire, of earth and of air. Her song murmured, she beseeched me to accept her ring on my finger, to be the husband of an Ondine, and to visit her in her palace and be king of the lakes. And as I was replying to her that I loved a mortal, sullen and spiteful, she wept some tears, uttered a burst of laughter, and vanished in a shower that streamed white down the length of my blue stained glass windows. Written in E-flat minor and based on the poem “Le Gibet”, the observer is presented with a view of the desert, where the lone corpse of a hanged man on a gibbet stands out against the horizon, reddened by the setting sun; a bell tolls from inside the walls of a far-off city, creating the deathly atmosphere that surrounds the observer. Throughout the entire piece is a B-flat octave ostinato, imitative of the tolling bell, that must remain distinctive and constant in tone as the notes cross over and dynamics change. The duration of Le Gibet is about 7:15. (What do I see stirring around that gibbet? Was it some cricket who sings lurking in the moss and the sterile ivy, which out of pity covers the floor of the forest? Was it some fly in chase sounding the horn around those ears deaf to the fanfare of the halloos? Was it some scarab beetle who gathers in his uneven flight a bloody hair from his bald skull? Or then, was it some spider who embroiders a half-measure of muslin for a tie on this strangled neck? — Maurice Ravel, on “Scarbo”. An excerpt of the Scarbo section appears in a mural in downtown Minneapolis, Minnesota. Written in G-sharp minor and based on the poem “Scarbo”, this movement depicts the nighttime mischief of a small fiend or goblin, making pirouettes, flitting in and out of the darkness, disappearing and suddenly reappearing. 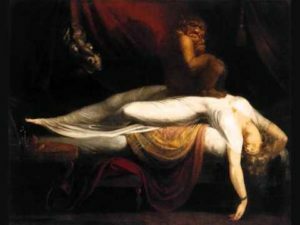 Its uneven flight, hitting and scratching against the walls, casting a growing shadow in the moonlight, creates a nightmarish scene for the observer lying in his bed. With its repeated notes and two terrifying climaxes, this is the high point in technical difficulty of all the three movements. Technical challenges include repeated notes in both hands, and double-note scales in major seconds in the right hand. Ravel reportedly said about Scarbo: “I wanted to write an orchestral transcription for the piano.”The duration of Scarbo is about 8:30.
understand how he got in, or how he escaped. How often have I seen him alight on the floor, pirouette on a foot and roll through the room like the spindle fallen from the wand of a sorceress! Do I think him vanished then? the dwarf grows between the moon and me like the belfry of a gothic cathedral, a golden bell shakes on his pointed cap! But soon his body becomes blue, translucent like the wax of a candle, his face pales like the wax of a candle end – and suddenly he is extinguished.